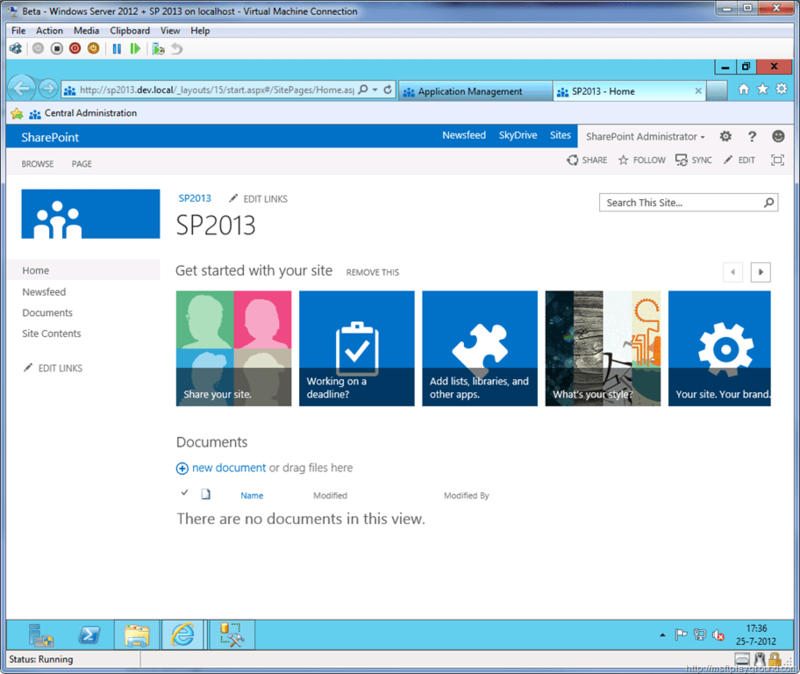 Last week we finished the installation of SharePoint 2013. For us to test the new version off SharePoint we still have to do some configuration. The first thing we will do is creating a couple of service accounts that we will use to create Service Application and Web Applications. Go to the Start Menu by using the Windows button or by going to the low left corner with your mouse. With the Start Menu open select “Active Directory Users and Computers”. Open the Users OU and use your other mouse button to add a new user. When you have the “New Object – User” window open create the following user. With the Start Menu open select “DNS”. Select the forward lookup zone of your domain and add a new A Host record. For this machine I chose the following domain: sp2013.dev.local. Select “Configure Managed Accounts” under “General Security”. 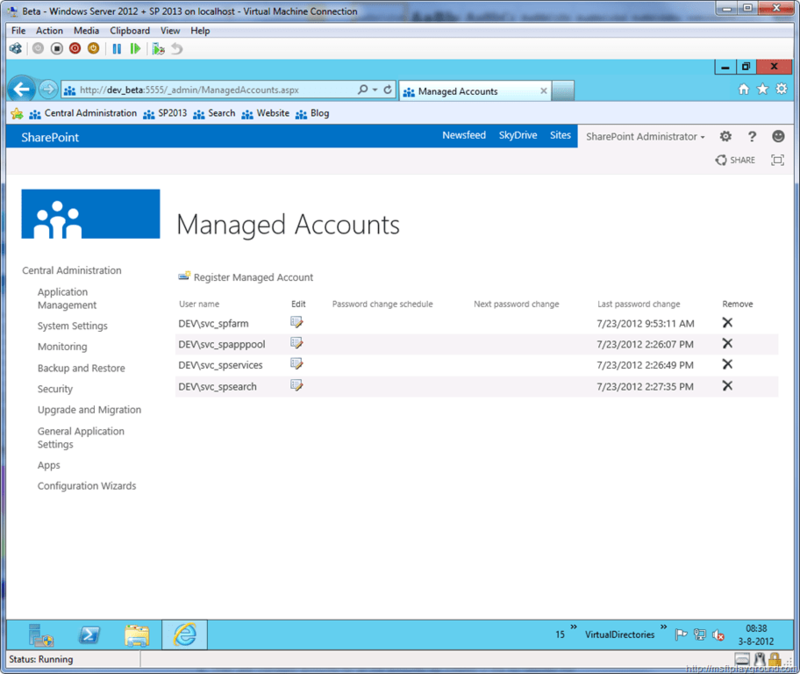 Then add managed accounts for all the accounts we created in the AD besides the spcontentaccess account. With the managed accounts in place it is time to create our web application. With “Central Administration” opened go to the “Application Management” section. On the toolbar select “New” within the toolbar. Create the web application with the following information. IIS Web Site Create a new IIS web site. Press ‘Ok’ to create the web application. When the web application is created we will define some managed paths to create site collections. Select the web application for which you want to define the managed paths. On the toolbar select “Managed Paths” within the toolbar. With the Managed Paths in place it is time to create a few site collections. Creating a site collection with these settings will create a my site host. We will also create a Team site and a Hub site. With the site collections in place we can start creating the several Service Applications. Create the Application with the following settings. The following service application we will be creating is the Managed Metadata Service Application. Select, Report Syndication import errors from site collections using this service application. Next up is a new service application called “App Management Service Application”. This service application will give you the ability to manage the new App solutions that are build into SharePoint 2013. 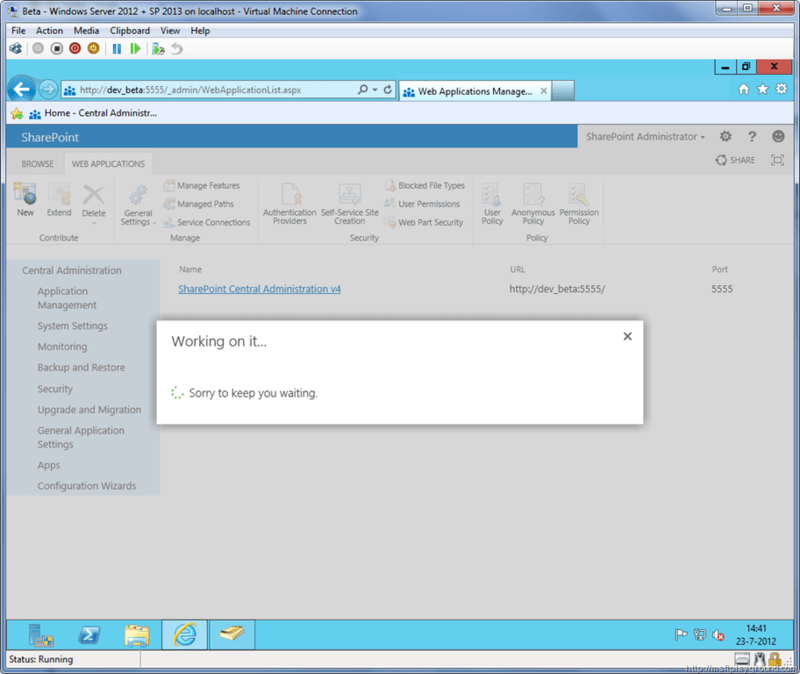 Create App Management Service Application Proxy Select, create App Management Service Application Proxy and add it to the default proxy group. A service application that was also in SharePoint 2010 is the BDC Application. When I was creating this service application I received multiple errors. Even when I retried to create at went wrong with the same errors. When I checked the application everything looked fine and seem to be working correctly. Another new Service Application is the Machine Translation Service Application. This application give you the option to translate all kind off documents. The texts that are in the documents will be translated by the online Bing translation services. Partition mode Don’t select this option. Add to default proxy list Select this option to add it to the default proxy list. The Search Service Application is the next service application we will create. There changed a couple off small things to the search service application but creating is still the same. Application Pool for Search Admin Web Service Create New Application Pool. SharePoint – Admin Search Service. Application Pool for Search Query & Site Settings Web Service Create New Application Pool. SharePoint – Query and Site Settings Pool. We will also create a Secure Store Service for when we would like to test connections to other systems like CRM. Enable audit Enable the audit log and set the days until purge to 30. The work management service is the last service application we will create trough the UI. This is also one off the new service applications. The work management service application will give users the ability to edit and change there tasks on one single place within the SharePoint farm. This service will take care of changing values on other places and aggregating the tasks. One off the great things it is also possible to synchronize exchange tasks!!! 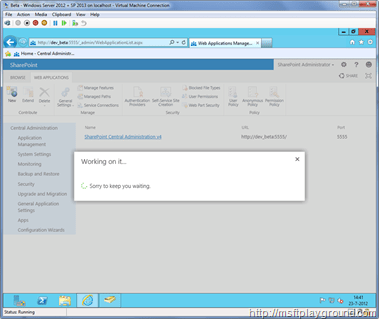 Service Application Proxy Select create proxy for this service application. This were all off the service application we will create trough the UI will will have to create the State Service Application with PowerShell. Run the “SharePoint 2013 Management Shell” as Administrator. With all the Service applications in place we will perform a IISReset make sure that all settings are refreshed. When these services are started we will make the farm account (svc_spfarm) local administrator. This is because off the same problem with SharePoint 2010. 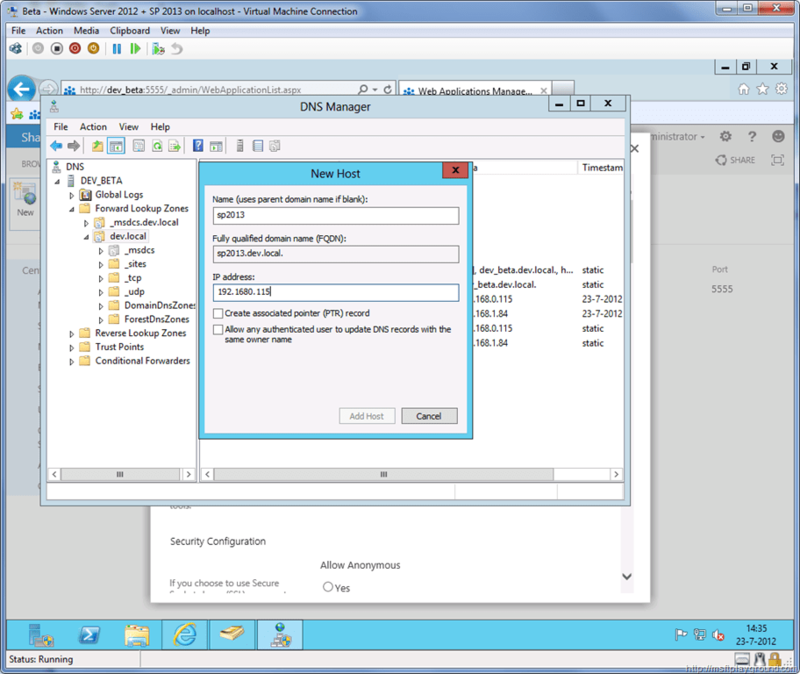 With Active Directory Users and Computers open open the domain and select the Builtin OU. Within the Builtin OU find the administrators group and add the farm account to it. 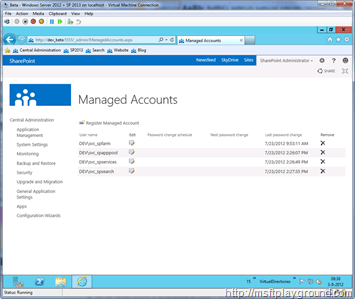 Perform a reset off your VM to reset the security of the farm account. Then go back the “Manage services on server” and start the “User Profile Synchronization Service”. When you will start this service you will have to connect it to a Service Application. Connect it to the User Profile Service application we created above. With all these service applications and web applications in place you have a great environment to start testing SharePoint 2013. If you have any further question just leave a comment and I will get back to you!! Are you sure ecery service is running in windows and that you dns entry and bindings in iis are correct? Sometimes a reboot can do wonders.